ID Shop, Inc. is pleased to announce a new product line geared toward the outdoor sports enthusiast in your life. Cyclists, Runners, and Paddlers alike will find a kit that fits their needs at the new site dedicated to durable, waterproof ultralight identification tags. 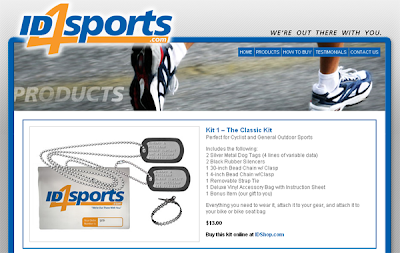 ID4Sports products are available in several styles, and are sold in four different kits. The Enduro Kit, including one metal dog tag, one color printed plastic tag, one neoprene strap, a beaded chain, and a shoelace strap for attaching an id to your running shoes. The Combi Kit, for the athlete who does it all! Includes several of the items in the two kits above. The Singlet Kit, for those who travel light. Includes a single metal dog tag and chain. Each kit also includes a zip-closure vinyl bag, instructions and a bonus gift for ordering.